Not much new to report on. Foam fishing is still great with large hoppers being the first choice for getting big fish to look up. Hoppers being a generic term for all big foam flies that float. Don’t forget to twitch. The twitch has been triggering strikes from big fish on all of the great rivers near Bozeman, Montana. 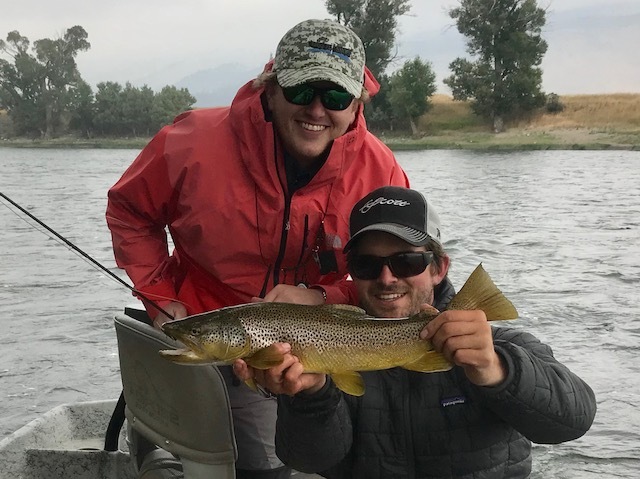 Our Montana fly fishing guides have been spending most of their time on the Madison River, Yellowstone River, Missouri River, and Yellowstone National Park as of late. Many of the smaller rivers are too low to float for the time being. Good time to mix it up and go wade fish for a day. Bring your favorite hopper, fish it well, and good things will happen. As good as it gets out there. Flows are right where we like them with fish holding and feeding all across, up, and down the river. Cooler temps and rain have kept us on our toes but the fish have stayed on the feed through the mud and cold fronts. Don’t be afraid to fish in the mud. Your tactics will need to change but big fish get dumb when they can’t see well. Try two of your favorite streamers or buggers dead drifted under an indicator. It works well. Less rain in the future forecast, look for the Yellowstone River to be totally clear by the end of the week and for the hopper fishing to be business as usual. We have been fishing just about every color in the rainbow with success but keep finding big pink hoppers on the end of our lines more often than others. Presentation is everything. Don’t expect any freebies in late August. One of the best dryfly years in recent memory continues on the Madison River. Ants and other smaller terrestrials have become key players in addition to hoppers, mayflies, and the all important caddis. River flows are still great and temps are perfect. Don’t be afraid to fish the middle of the river. Lots of big brown hiding behind subsurface rocks. The bite has been steady from mid morning on. Cooler mornings mean you don’t have to race to be the first boat on. Our Madison River fly fishing guides have been mostly fishing from Ruby Creek down through Ennis, but the bite has been good all over. Look for this trend to continue through the end of the month. Flows are great right now for getting out the boat and using your feet to catch trout. Wade on! Dryfly fishing is all about opportunities. There are lots of opportunities right now on the Missouri River. Many long time Missouri River fly fishing guides are saying its as good as they’ve ever seen it in August right now. The trico hatch is thick, consistent, and keeping lots of fish looking up. Terrestrial fishing has picked up and anglers can expect action all day long with ants, beetles, and hoppers. Nymphing and trolling with crayfish has remained solid on the upper river along the grass edges and up against the bank. Aquatic grass is there but not too bad. Shaping up to be one heck of a fall. Still need to book your Missouri River fly fishing trip for Fall 2018? Give us a call today. Fly fishing in Yellowstone Park has been great all month and looks to only improve as we move into late August. Not too crowded this year. Maybe the smoke has been keeping people at bay. Focus your efforts on the Yellowstone River and its many tributaries. Flows are low enough that crossing streams is very possible now, a wade fishermen’s paradise. You’ll find our guides mostly on the Lamar River and Slough Creek in the AM through PM and occasionally on Soda Butte Creek in the PM. Lots of hoppers and smaller terrestrials around. Had a couple grey drakes flying around this past week with the cooler and rainy weather. A sure sign that fall is coming. Hot tip for you: probably not worth hiking into Cache Creek to fish it. Too low. Had to find that out the hard way. With everything else fishing so well right now, the Spring Creeks are not our first choice to fish right now. Fishing has been good, but you can fish the creeks all year! August is a great time to fish more seasonal waters. Head into Yellowstone National Park for endless miles of great wade fishing or wander up the Gallatin River for great wade fishing closer to Bozeman, MT. If you must fish the creeks here’s the scoop: Hatches have been thin, blind fishing with hoppers, ants, and beetles is your best bet for dryfly success. Nymphing in the riffles with scuds and midges remains good. Look for sulphur hatches to improve in the coming weeks.